One of the easiest and most central Edinburgh viewpoints to access is the rooftop terrace on the Museum of Scotland. You can find the museum on Chambers Street - be sure to spend time exploring the exhibits too! - and it's free to enter. The rooftop is on the seventh floor, accessible by lift, so anyone can visit this viewpoint! It's very close to the city centre, so the view doesn't extend as far as more elevated locations. Nevertheless, you can still see the line of the Royal Mile, most notably the Castle and the Hub. There are also views in all directions, of Greyfriars Kirkyard, the University of Edinburgh, and Holyrood Park. It's worth noting though, that due to the design of the roof, some angles are slightly obstructed! 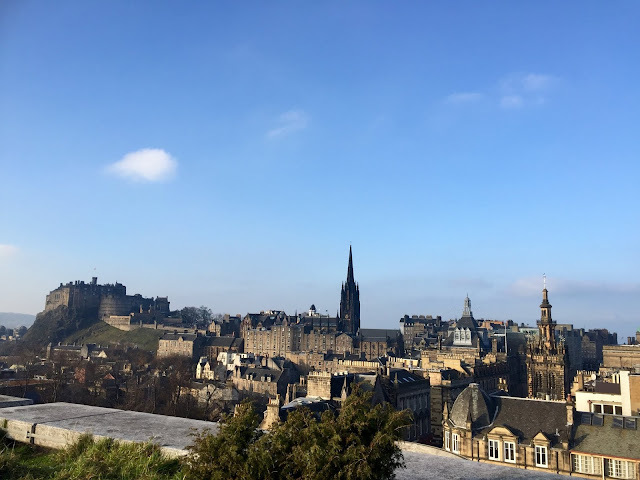 The Edinburgh view from Calton Hill is one of the most famous in the city - you'll see it all over tourism brochures and adverts! It's pretty popular among visitors, but for good reason! 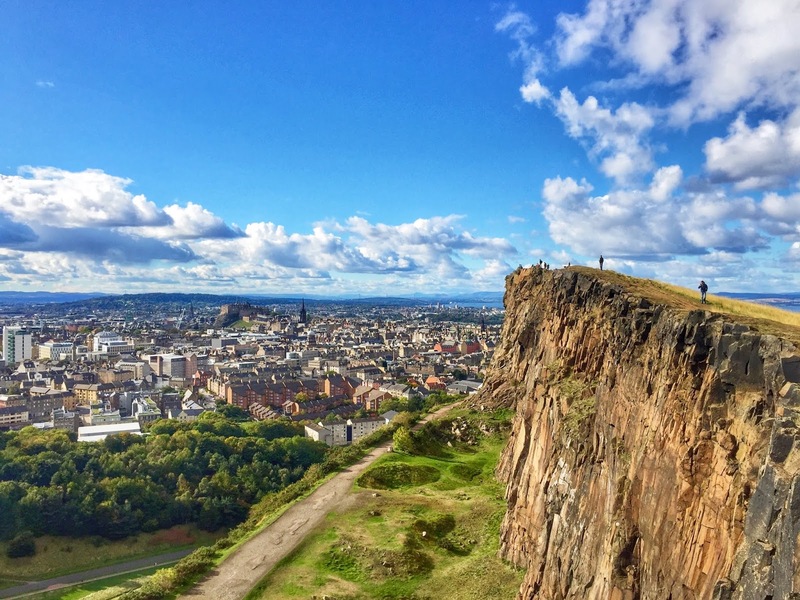 Located at the east end of Princes Street, it's a short, ten minute climb, via a sloping path or stairs. The Dugald Stewart Monument is the circular, Grecian style structure in the forefront of this view. There are several other monuments on the hill worth checking out too though! From here, you can see the contrast between the Old and New Towns, with a prominent view of Princes Street and the Balmoral Hotel. In other directions, you'll find Holyrood Park, and the Firth of Forth - yes, Edinburgh is that close to the ocean! Holyrood Park is a popular place to visit, with Arthur's Seat towering over the city centre. And while that's definitely worth climbing if you can, I would actually argue that the Crags are a slightly better Edinburgh viewpoint. From here, you are lower and closer to the city, and so you can see the buildings better than way up top. It's an easier walk along the Crags, and you can capture photos with them visible in the forefront, making for dramatic scenes. It's well known that Edinburgh is built atop several hills, and this viewpoint really allows you to see that side of it. Holyrood Park led to discoveries about erosion and geology, so this is part of the city's most ancient history on display. All of the major city centre sights are visible too, along with the Firth of Forth to the north. If you want more secluded Edinburgh viewpoints, away from the city centre and crowds of tourists, you'll need to do some hiking. Rest and Be Thankful is located on the slopes of Corstorphine Hill, to the western side of Edinburgh. You can reach it by bus, and then choose to do either a short hike up and down from the main road, or take longer to explore Corstorphine Hill itself. Either way, the viewpoint offers a break between the woods, looking to the east over the city centre. You can make out the Castle and the other city centre buildings, with Arthur's Seat behind them. The monuments on Calton Hill are also visible, and on a clear day, you can see all the way to Fife in the north. This viewpoint is actually mentioned in the Robert Louis Stevenson novel 'Kidnapped', when the characters pass by it. To really get out of the city, and for one of the highest Edinburgh viewpoints, the Pentlands are where to go. These hills are just south of the city, accessible by bus or car. You can spend hours hiking different routes through the hills, with views in all directions. For the most spectacular scene though, the Capital View Walk is the best choice. This curves up over the top of the ski centre, placing you at the perfect angle to see all of Edinburgh. Yes, the buildings look pretty small from up here, but it's still an incredible viewpoint. The hike itself takes a couple of hours, and you do climb pretty steep slopes, but it's worth it. From here, you can see how Edinburgh fits in to the natural scenery, with so much of the landscape, as well as the buildings, on display. So there you have it, a selection of the best, free Edinburgh viewpoints that I know of! Which of these views is your favourite? Are there any other locations you would suggest? Let me know in the comments!